For businesses across all sectors, from manufacturing to financial services; iSeries & AS/400 automation has a demonstrable impact on operational efficiency. Across all applications and functions, NYCO's unique suite of automation products acts as a formidable operations 'grapevine' which keeps your company in touch with itself more effectively. For information on how NYCO can help you with iSeries & AS/400 Consultancy and tailor-made hardware and software, visit our support pages. 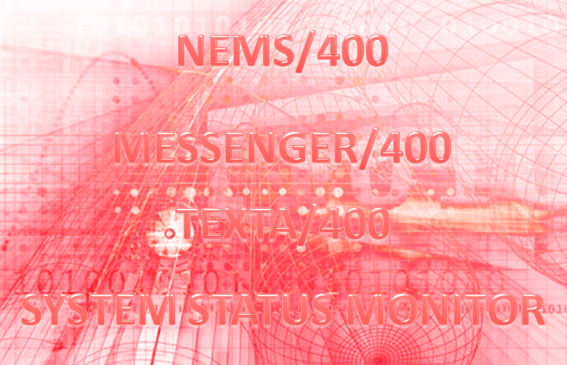 MESSENGER/400 is a message monitoring and texting/paging/e-mail tool, which has been developed by NYCO Ltd. The product has been in the market since 1991, and enjoyed great success. MESSENGER/400 allows you to send system, application and manually generated messages to a mobile phone, pager or e-mail. Built into the product is the ability to answer system generated messages automatically, and have the results sent out to you. A series of message filtering options have been built into MESSENGER/400 which allow you to 'match up' against, message id, user, text, shift, days, user group and machine (applicable for multi machine networks). A shift option is included allowing messages to be sent to different staff depending on the time of day or the day itself. Also available is the option to monitor as many or few message queues as is required. The ability to network machines so that they send messages out via a single host is a valuable feature built into MESSENGER/400. You can also nominate multiple hosts with automatic switching in the event of the main host iSeries or AS/400 being down. The product runs across all operating system releases up to and including V7R1. TEXTA/400 is in essence a 'mini messenger'. Designed to fit into the business running a restricted budget, TEXTA/400 will allow you to monitor one message queue and have those messages sent to a single or multiple mobile phones and/or pagers and/or e-mails. Obviously not every message is required so a limited degree of message filtration via severity levels has been introduced. Like its sister product, TEXTA/400 will allow you to send out text messages to multiple mobile phones and pagers using different services in addition to e-mails. Complementing the TEXTA/400 automation suite of products, System Status Monitor has been designed to give simple but effective TCP/IP network monitoring. Loaded on the iSeries or AS/400, SSM will poll devices at regular intervals to ensure they are still showing on the network. Should a device not be found, a message is generated which can be sent out to either a pager, mobile phone or e-mail (using TEXTA/400 or MESSENGER/400) as well as appearing on the main screen. The product also handles primary and secondary IP addresses.